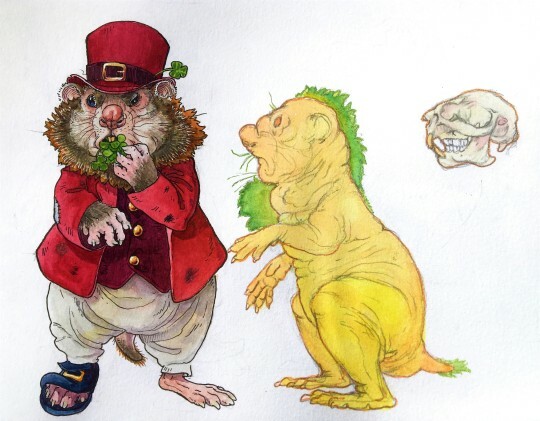 With Saint Patrick’s Day coming soon do you think you could make a profile on Leprechauns, which i’m guessing in your world setting’s a type of rodent, correct? Quite correct! They are in fact just a subspecies of gnome (Homunculus barbatus), which are more solitary relatives of trolls and goblins. While trolls hunt and forage in organized family groups, gnomes (including leprechauns) tend to work alone, though they are often up to the same mischief. Like trolls, it is actually female gnomes with the bushier “beard”, especially after giving birth, as they use their own fur to line their nests. Beard color usually varies from rusty red to mousy grey. The ancestors of these strange, stocky rodents are believed to have evolved in tandem with early Europeans, much as modern housecats self-domesticated through a mutually beneficial relationship with humans. They are capable of walking and running on their hindlegs in order to carry more stuff in their forepaws. Remarkably opportunistic creatures, they thrive on stealing from humans, hoarding food and acquired treasures in large burrows. Sometimes several related individuals will share a hoard, but their nightly roaming grounds almost never overlap. All members of the genus Homunculus are highly intelligent and can learn new behaviors from observing both each other and humans. Most notably, the tendency to wear clothes, which is favorable as their bodies do not retain heat well and it allows them to forage longer into winter. It is unknown if this began from mere observation by gnome ancestors living in human houses, or was directly taught to an animal living in a human family. Garments can be anything from rags to fine coats (nicked from humans, as they cannot make their own), but they do seem to have a preference for the color red. They have no concept of actual monetary value and may bring “gifts” from their own hoards ranging in value from from trinkets to literal gold in exchange for offering them food. While early legends portray leprechauns as helpful shoemakers, they are far more likely to make off with your shoes, cookies, alcohol etc without a hint of remorse. Little bastards.